Create a fun and meaningful connection with your crew by showing them how awesome a ride can be with a cargo bike designed to grow with you. The thing our customers have told us most often over the past 20-plus years? “I wish I’d gotten an Xtracycle sooner.” So we can honestly say this: If you wait too long, you’ll probably regret it. Kids grow up fast, and toting them around on bicycle adventures is just so much fun for them—and you. We feel that we owe it to our potential customers to let them know this. There are moments and memories that you just do not want to miss. And, luckily, our Junior Co-Pilot Passenger System is the safest way to carry kids on a bike! Why raise your kid on an Xtracycle? FUN FOR THE FAMILY: The Xtracycle lifestyle naturally educates and entertains kids and brings a smile to parents’ faces. Turn any trip or errand into an adventure as you cruise through the fresh air together. 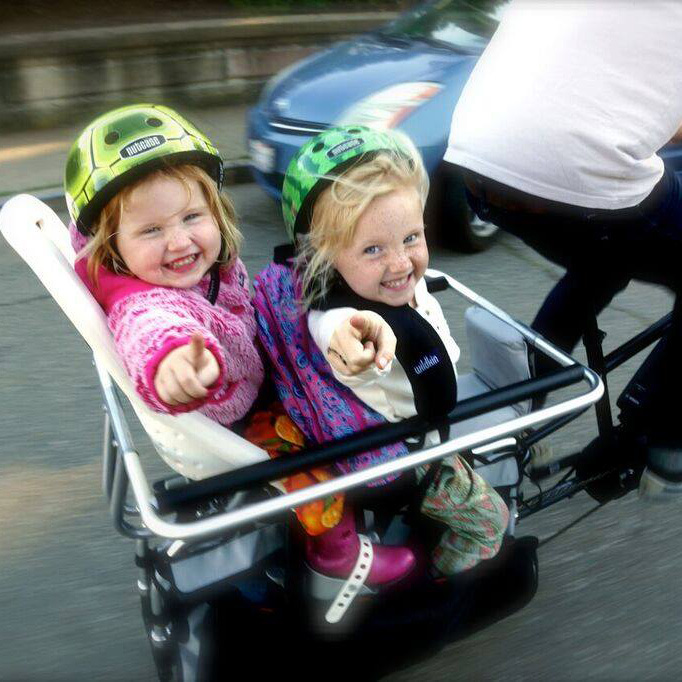 KIDS HATE CAR SEATS: But they love cruising along on a bike with family and friends! Plus our modular Junior Co-Pilot Passenger System accommodates multiple kids of different ages with ease, and it also includes the comfiest, smartest cargo-bike child seat available. MAKE DROP-OFF & PICK-UP A BREEZE: No more waiting in an endless line of idling, polluting cars to drop off and pick up kids at school, practice, etc. Just roll up and then roll on. YOUR KIDS WILL THANK YOU: Make no mistake: kids that grow up on the back of an Xtracycle have more fun, and they remember it for the rest of their lives. We’ve even been around long enough to see multiple generations of Xtracyclers in a single family. OUR BIKES GROW WITH FAMILIES: Our modular Junior Co-Pilot passenger system is designed to accommodate kids of all ages and evolves as your kids grow and your needs change. EXCEPTIONAL SAFETY & RELIABILITY: An Xtracycle is a safe and predictable vehicle for you and your family for traveling, running errands, playing, commuting, shopping, camping, and more. 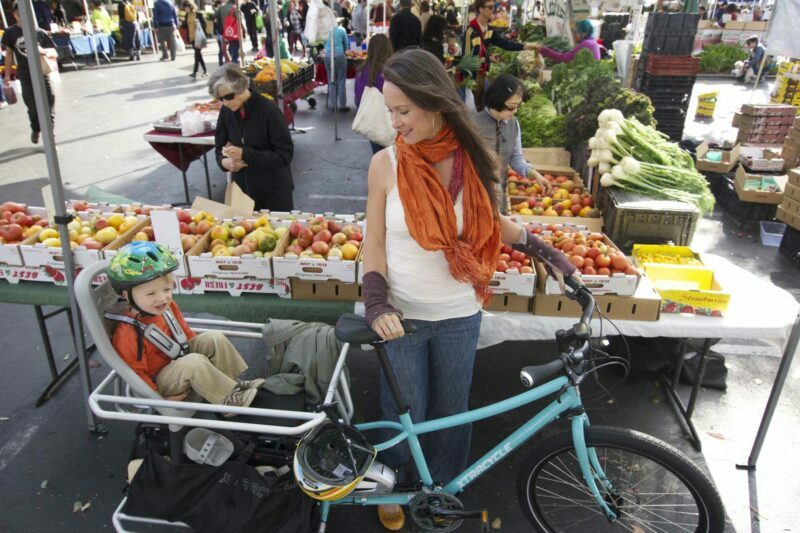 Our cargo bikes exceed the world’s most stringent safety standards. We trust them with our kids, so you can relax and enjoy the ride. PASSENGER-PERFECT: Before Xtracycle, very few people in the U.S. considered carrying more than one child on a bike, and it was basically illegal to carry an adult. Bikes wobbled with kids aboard, loading and unloading was an exercise fraught with risk of tipping over, and just when you got the hang of it, along came (another) baby. The EdgeRunner changes everything. You’ll be able to easily do things you probably never thought possible on a bike: shuttle yourself and your date to a movie or whistle show tunes while pedaling your child and their two best friends to the park. ROCK-STAR PARKING: Everywhere you go, you’ll skip the traffic, lines, and parking lots that corral and cramp motor vehicles and slow everybody else down. School dropoff and pickup? Roll up on an Xtracycle and treat your kid like a rockstar! READY FOR ANYTHING: Whatever you need to do and wherever you need to go, an Xtracycle cargo bike is always up to the task: work, play, commuting, camping, school, parks, family fun, errands, groceries, hardware store… You name it; we’ve done it! IT JUST FEELS GOOD: Move the body and spirit by bike. When you hop on a cargo bicycle, you escape the box, look around, take a deep breath, and get connected to yourself, your community, and your environment. The more we move our legs, hearts, and lungs, the happier and healthier we are. It’s a fact.